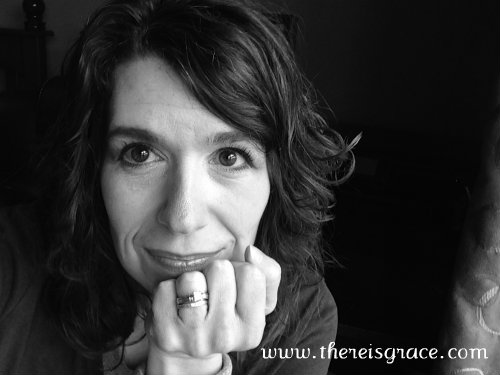 Today, I’m honored to have my friend Nancy from There is Grace guest posting with some great ideas for easy (and somewhat healthy) summer snack ideas. Let’s face it…no one wants to spend their summer slaving away in the kitchen. But if your kids are like mine, they still want to eat…at least three times a day, and snacks in between! 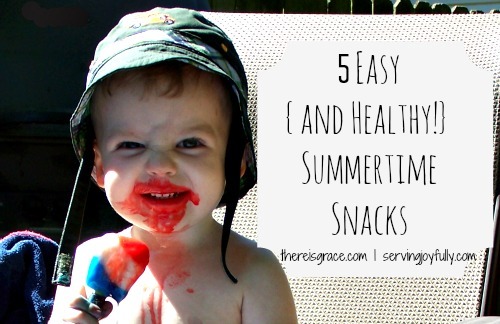 So, here are 5 Easy Summertime Snacks to keep your kids satisfied and help get you out of the kitchen in record time. Plus, they’re a lot healthier than store-bought options! These are a favorite of ours. Simply buy some popsicle molds and fill with your favorite healthy, freezable options. Some of our favorites are yogurt & fruit, applesauce & fruit, water & fruit (are you seeing a theme, here? ), fruit juice, pureed fruit, and leftover smoothies. The options are truly endless, and it’s a great way to keep the kids hydrated and up their fruit intake! And they love creating new and personalized concoctions each time. Use up all those too-ripe bananas with this creamy and yummy treat. Peel, slice and freeze bananas for at least an hour (or until they are solid). Put frozen bananas in a blender with 1/2 to 1 cup of milk, and blend. Add more milk until you achieve a creamy, ice cream-like consistency. (For dairy allergies, use soy, rice, or almond milk in place of regular milk.) Add your favorite toppings (sliced fruit, mini chocolate chips, whipped cream, etc.) for a guilt-free sundae! Gather your favorite yogurt, sliced fruit (fresh or frozen), and granola. Layer in a glass bowl or dessert dish (because seeing the pretty layers is half the fun) and enjoy! For variety, switch out the granola for another crunchy cereal or crushed graham crackers. There are so many options! Dish up your favorite flavor of yogurt and add graham bunnies (like Annie’s brand organic bunny grahams) or organic animal crackers. Arrange the bunnies (or animals) in the yogurt as if they are trekking through a snow-covered mountain scape. Experiment with other landscape-friendly options (fruit boulders and pretzel trees anyone?). Stack several pieces of sliced fruit on a bamboo skewer, or make smaller kabobs by stacking them on a toothpick. Almost any fruit will work. Some of our favorites are sliced bananas, strawberries, apples, grapes, blackberries, and peaches. For extra fun, dish up some vanilla flavored yogurt for dipping! Nancy is a lover of words and all things chocolate. 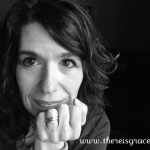 She is married to her best friend, and when she’s not settling sibling squabbles between her Little Miss and Little Man, she can be found sipping coffee and writing about faith, family, and finding grace at There Is Grace. What are some of your favorite summer time snack recipes? Crystal, thanks so much for the opportunity to share these tips with your readers. I hope they find them helpful! This is a great idea! I love easy snacks! Thanks for sharing at Mom’s Library this week!